This tour has been specially designed for families with children: short transfers, horseback riding and "a la carte" activities. A very balanced tour with cultural visits, horseback riding in the Orkhon Valley, camel ride in the Bayan Gobi, search for the wild Przewalski's horses and encounters with nomadic families. 100% accommodation in yurts (outside Ulan Bator): 3 nights in yurt camps with showers + 4 nights in a nomadic family's yurt. "Nomadic experience": 4 full days with a nomadic family to experience their traditional way of life. 100% financial guarantee for your tour in Mongolia. June 13 to 22, 2019 : 1300 €/person. + 60 € / pers. (2 nights in Ulan Bator only). This single room supplement applies if you want a single room in Ulan Bator. No single supplement is due if you are OK to share your room with another person (same gender) even if we do not find another person willing to share. Day 1: Meeting at the arrival lobby of Ulan Bator Airport at 10:30 (please book a flight arriving before 10:05am). If you are already in Ulan Bator, the meeting point is in the lobby of the hotel at 14:00. Day 13: Transfer to Ulan Bator airport on time for flights departing after 07:10am. Please wait for our written agreement on your flight schedule before buying your tickets. Tour and visits as described, horse riding with the nomads, camel ride, full board from dinner of day 1 to breakfast of day 10 except 1 dinner, English speaking translator, Russian 4x4 with driver, nomadic equestrian guide, financial guarantee of your deposits. International flights, 1 dinner, drinks except water, tea and coffee, personal expenses, booking fee (15 €/person), travel insurance, visa if necessary. Yes, it is possible to travel to Mongolia with children! Of course, we must take into account the specific needs of your children and we studied their journey to ensure maximum variety (visits, horse or camel rides, encounters with nomads ... ) with the shortest possible transfers. Your English speaking translator is waiting for you at Ulan Bator airport at 10:30 (arrival of Turkish Airlines flight). Visit of Gandantegchinlin Monastery and the National Museum of Mongolian History. Dinner downtown and overnight at Dream hotel or similar (2* - twin or triple room). Breakfast, and transfer to Hustai National Park. Lunch at the Hustai yurt camp. In the afternoon, we go on a drive in the Park with our 4x4 vehicle to try and find the Takhi, the wild Przewalski's horses. Dinner and night at the yurt camp (2 to 4 persons per yurt, with single beds, showers in a separate building). Breakfast and drive to Karakorum, picnic lunch en route. Visit of Erdene Zuu Monastery. After breakfast, we drive on the dirt tracks of the Orkhon Valley. Along the way, we stop at the Tovkhon Monastery. A short hike (about 1 hour up and 45 mn down - you can rent horses if you want) is necessary to reach the Monastery. At the end of the day, we reach the yurt camp of the nomadic family who will welcome us during 4 days. Night in a guest yurt close to the one of our nomadic friends. During 4 nights, we will sleep in a "guest-yurt" close to our nomad family's yurts. These three days are devoted to horse riding and discovering the traditional lifestyle of the nomads of Mongolia. The program is very flexible, the idea is to let you very free so you can tailor your activities according to your desires. The horses are at your disposal, as well as your translator and the equestrian guides of the nomadic family, so you can ride when you want. The nomads adapt the pace to your riding ability. It is possible for example to plan a horse ride for beginners in the morning and another one in the afternoon for riders with a faster pace. Similarly, your vehicle and driver are at your disposal if you want to visit a place which can not be reached in a day on horseback. Do not be overwhelmed by the tours and horseback rides, try to take the time to sit quietly in camp, playing with children, helping to care for the herd if you want ... to really appreciate the unique lifestyle and the sweetness of life in the wilderness among the herds. We can participate in their daily activities, and become acquainted with the various family members. However, we recommend that you go at least for one horse ride to the most famous Orkhon Falls. The last evening, our hosts will prepare a traditional specialty, the Khorkhog, the "Mongolian barbecue". Nights in a guest yurt close to the one of our nomadic friends. Last morning with our nomadic family. After lunch, it's time to say goodbye to our host family. Transfer to Khogno Khan Park. We will enjoy a camel ride in the dunes of the "Mini Gobi", and a visit of the Ovgon Khiid Monastery. Dinner and night in the guest-yurt of another nomadic family. Breakfast and early departure to Ulan Bator where we arrive in the afternoon. The rest of the afternoon is dedicated to shopping in stores downtown. In the late afternoon, you will attend a show with traditional dances, music and songs from Mongolia, especially the amazing Khoomei. No dinner included, to let you choose among the varied dining opportunities offered by Ulan Bator. Night at Dream hotel or similar (2* - twin or triple room). Breakfast and transfer to airport on time for flights departing after 07:10am. This is a "comfort" tour: no nights in tents, you will enjoy the most comfortable accommodation available in Mongolia. 2 nights in a 2* hotel in Ulaanbaatar. This tour is for beginners and novice riders. A horse will be at your disposal during your stay with the nomads, and your translator will accompany you on horseback if you want to try this activity. "A wonderful experience to share with your family. Our company's managers created this tour for their own children, tried and trusted!" Hike in the Khangai Mountains with your children: they will have a horse to be able to follow your pace ... and for more fun! 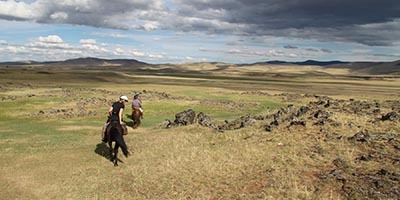 For novice riders, this tour combines 2 outdoor activities: hiking and horse riding, in Khangai Mountains and Orkhon Valley.